A RUP LIFE: Keep Clean with Festive Soaps from Dial! Keep Clean with Festive Soaps from Dial! I love adding holiday touches throughout the house during the Christmas season. We usually use just basic soaps but at Christmas time we amp it up with festive touches. 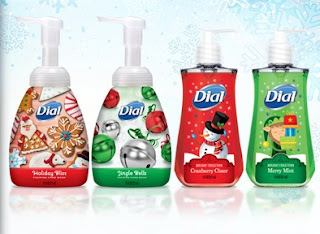 This year we are featuring Dial Soap's Holiday editions. These are wonderful soaps that add a bit to the decor. The scents are pleasant and not at all overwhelming. Two of my kid's love scented hand soap. They both have told me how much they enjoyed these in our bathroom - and you know if they like the soap they will actually use it!! Look for these fun soaps at your local retailer this holiday season!